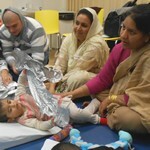 We run a number of sessions to provide support to parents and children in a group setting. Two groups we currently run are the sensory group and the motor group. The Ryegate Motor Group is run by physiotherapy staff and works with a small group of children on a weekly basis over a six week period. The group focuses on a specific area of motor development such as practising sitting, balance or improving balance and co-ordination. Tasks are broken down into individual parts and repeated and practised by children. Children are referred to Sensory Group by their therapist, with invitations being given to parents/carers of pre-nursery children. We want children to enjoy play using all their senses. 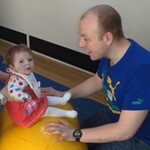 Playing is also a great way to develop movement and to encourage early communication skills. Each session is planned with defined goals and play experiences for each child. We provide a safe environment where parents/carers and therapists can share experiences and suggestions of different ways of caring for their child.